TORONTO, Oct. 2, 2018 /CNW/ - Excellon Resources Inc. (TSX:EXN and EXN.WT.A; OTC:EXLLF) ("Excellon" or the "Company") is pleased to report initial exploration results from the Miguel Auza project in the state of Zacatecas, Mexico. This program is the first drilling at Miguel Auza since 2010 and follows an extensive, year-long prospecting and mapping program which has identified several high priority targets. "The goal of initial drilling at Miguel Auza is to test structures at depth and along strike for their potential to host economic mineralization. These results confirm proof of concept," stated Ben Pullinger, Senior Vice President Geology. "We have seen grade and width improve at depth at Lechuzas and high-level epithermal textures and anomalous precious metals at Lechuzas, El Cobre and Abejas. Our expanded drill program will focus further understanding the greater system around Miguel Auza." All intersections reported as core length. AgEq drill results assumes $1,200 Au, $15.00 Ag, $0.95 Pb and $1.10 Zn with 100% metallurgical recovery. The objective of the initial drill program is to drill test targets developed from surface mapping, IP surveying and structural work since mid-2017 at El Cobre, Abejas, Lechuzas-Carmen and Lomo de las Minas (referenced in Figure 2 – Miguel Auza Targets). These first holes have intersected broad zones of anomalous, gold, silver and base metal values including discrete higher-grade zones of carbonate veining, bladed calcite and silica with associated galena, sphalerite and pyrite. Excellon is expanding the program to follow up on these initial results and to test other targets. Additionally, the Company has commenced a fluid inclusion study to better define the temperature regimes associated with these structures for more accurate drill targeting. 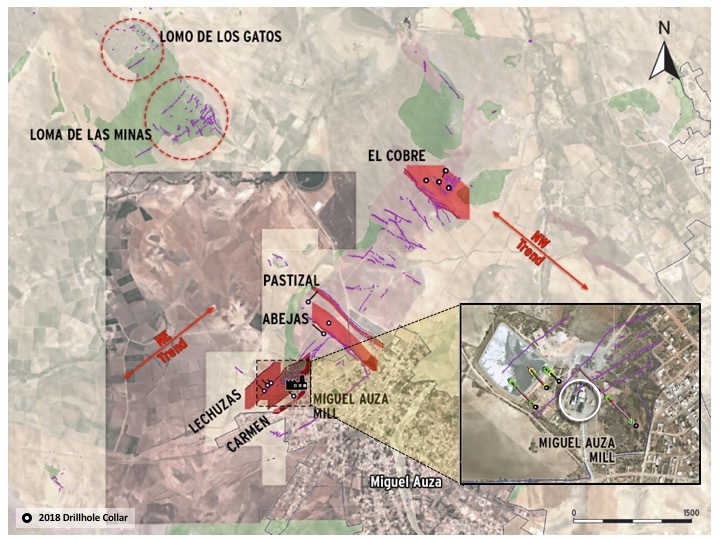 Mineralization at Miguel Auza is hosted in epithermal quartz veins typical of the Fresnillo silver belt, most proximally at Hecla Mining Company's San Sebastián Mine, 42 kilometres to the northwest and along strike from Miguel Auza. Mining was historically undertaken on the Calvario Vein at Miguel Auza and via multiple shafts along the structures being tested as part of this program. The Miguel Auza property also includes a mineral processing facility, which the Company utilizes to process ore from its Platosa Mine in the state of Durango, Mexico. The mineral processing facility currently has capacity of 800 tonnes per day ("tpd"), with a 650 tpd ball mill in operation and a second, 150 tpd ball mill on standby, with opportunities available for further expansion. Ample capacity remains available to process increased Platosa Mine production and potential new discoveries at either Platosa or Miguel Auza, along with ore from San Sebastián expected to enter bulk sample testing pursuant to a toll milling arrangement later this year. Mr. Ben Pullinger, P. Geo., Senior Vice President Geology, has acted as the Qualified Person, as defined in NI 43-101, with respect to the disclosure of the scientific and technical information relating to exploration results contained in this press release. Excellon's 100%-owned Platosa Mine in Durango has been Mexico's highest-grade silver mine since production commenced in 2005. The Company is focused on optimizing the Platosa Mine's cost and production profile, discovering further high-grade silver and carbonate replacement deposit (CRD) mineralization on the Platosa Project and epithermal silver mineralization on the 100%-owned Miguel Auza Property and capitalizing on the opportunity in current market conditions to acquire undervalued projects in the Americas. 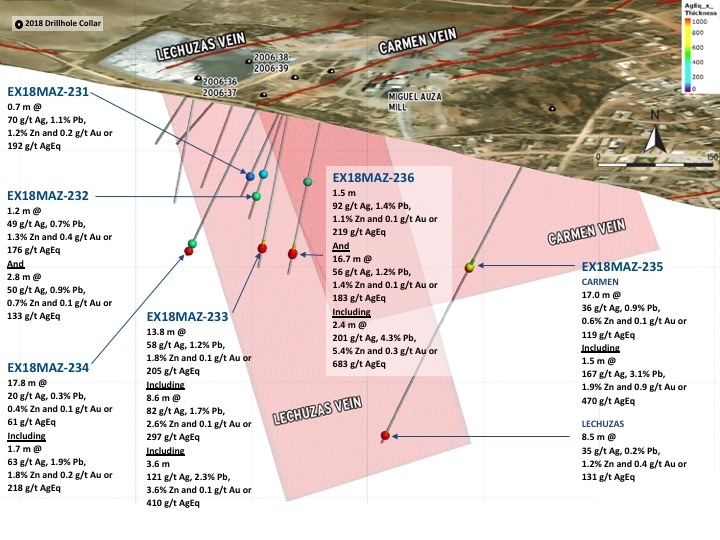 Additional details on the La Platosa Mine and the rest of Excellon's exploration properties are available at www.excellonresources.com. The Toronto Stock Exchange has not reviewed and does not accept responsibility for the adequacy or accuracy of the content of this Press Release, which has been prepared by management. This press release contains forward-looking statements within the meaning of Section 27A of the Securities Act and Section 27E of the Exchange Act. Such statements include, without limitation, statements regarding the future results of operations, performance and achievements of the Company, including potential property acquisitions, the timing, content, cost and results of proposed work programs, the discovery and delineation of mineral deposits/resources/reserves, geological interpretations, proposed production rates, potential mineral recovery processes and rates, business and financing plans, business trends and future operating revenues. Although the Company believes that such statements are reasonable, it can give no assurance that such expectations will prove to be correct. Forward-looking statements are typically identified by words such as: believe, expect, anticipate, intend, estimate, postulate and similar expressions, or are those, which, by their nature, refer to future events. The Company cautions investors that any forward-looking statements by the Company are not guarantees of future results or performance, and that actual results may differ materially from those in forward looking statements as a result of various factors, including, but not limited to, variations in the nature, quality and quantity of any mineral deposits that may be located, significant downward variations in the market price of any minerals produced, the Company's inability to obtain any necessary permits, consents or authorizations required for its activities, to produce minerals from its properties successfully or profitably, to continue its projected growth, to raise the necessary capital or to be fully able to implement its business strategies. All of the Company's public disclosure filings may be accessed via www.sedar.com and readers are urged to review these materials, including the technical reports filed with respect to the Company's mineral properties, and particularly the September 7, 2018 NI 43-101 technical report prepared by SRK Consulting (Canada) Inc. with respect to the Platosa Property. This press release is not, and is not to be construed in any way as, an offer to buy or sell securities in the United States.